"Chicky"**5x7.5**Diamond Girl Art*So ORIGINAL & VERY RARE! "Basket"**5x7.5**Diamond Girl Art*So ORIGINAL & VERY RARE! "Bethany"**4x5**Diamond Girl Art*So ORIGINAL & VERY RARE! 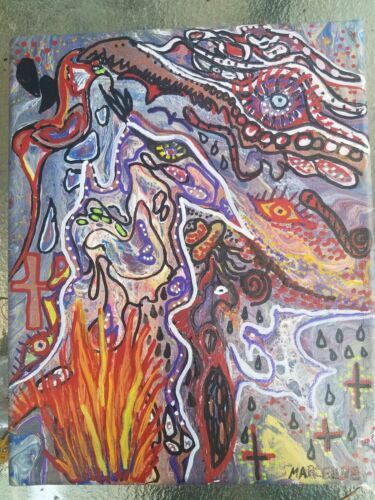 "Yum Hun"**7x8**Diamond Girl Art*So ORIGINAL & VERY RARE! ROBERT WEE MAJESTIC MOUNTAIN VALLEY LAKE WINTER PRINT HOME INTERIORS 19.5"X16.5"
Pretty Mermaid memories *7x8** **Diamond Girl Art *So ORIGINAL & VERY RARE! "Set of 4 Art Pieces"*6×8*Diamond Girl Art*So ORIGINAL & VERY RARE! Howard Finster's Granddaughter, Heather's "Framed Bottle House Painting"
Tim Lukowiak Fine Art Print The Negotiation Outside Art Fantasy 13" x 19"
Acrylic painting. Orginal piece. Urban art. Feminism. Howard Finster's Granddaughter, Heather's "Framed UFO Alien Painting"
"Oh yeah yellow "**4x5** **Diamond Girl Art *So ORIGINAL & VERY RARE! Do the Hucklebuck! Original Art Painting! "Bunny hunt"**4x5** **Diamond Girl Art *So ORIGINAL & VERY RARE! "Goodbye summer"**3x5** **Diamond Girl Art *So ORIGINAL & VERY RARE! "Set of 4 Art Pieces"*5×8*Diamond Girl Art*So ORIGINAL & VERY RARE! "Bunny mushrooms"**4x5** **Diamond Girl Art *So ORIGINAL & VERY RARE! "Set of 4 Art Pieces"*3x5*Diamond Girl Art*So ORIGINAL & VERY RARE! "Set of 4 Art Pieces"*5x7*Diamond Girl Art*So ORIGINAL & VERY RARE!